It’s an all too familiar story. A gracious older home is purchased in a wealthy enclave or resort frequented by the rich. While seemingly perfectly adequate, it is torn down, replaced by a bigger, brasher mega-mansion seemingly out of context with the landscape, natural beauty, and character of the neighborhood. What we sometimes forget is the “Tear Down” is not a recent phenomenon. The reviled practice dates back not to the 1980s and 90s, but a full century earlier, with plenty of examples to be found in the 1880s and 1890s. This post will take a look at a few of Newport’s notable Teardowns during the Gilded Age. Newport’s popularity, already well established by the Civil War, grew exponentially over the decades following it. Bellevue Avenue and other fashionable streets were lined with commodious villas built in the Italianate, second empire, or newer-fangled Stick and Shingle styles. Things took a marked turn in the latter half of the 1880s when the “nouveaux riches” and colossally wealthy plutocrats descended on the resort en masse. Eager to establish themselves amongst their well-heeled peers, they decided to make up in brick and mortar with what they lacked through blood or marriage. Hiring the chic architectural firms of the day to produce replicas of French chateaux, Elizabethan manors and Italian palazzo fit for European nobility (or even royalty), for them, they forever altered the landscape. At first, some of the older families derided the new obscenely scaled “white elephants” going up around them, but the writing was on the wall. Soon enough, those with sufficient funds and ambition to play in this newly defined social and architectural field followed suit. 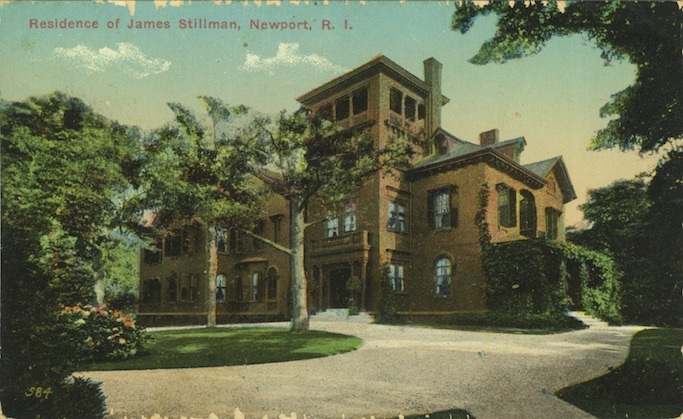 By this time many of the prime parcels in Newport’s most desirable neighborhoods had already been built upon, however. In some cases, existing cottages were remodeled or added onto (often beyond recognition). In others, older George Champlin Mason or Peabody and Stearns designed rambling cottages were unceremoniously razed, giving way to newer Hunt, Trumbauer or McKim Mead and White designed extravaganzas. Members of the Kernochan family, along with their Lorillard relations were among the early builders on Ochre Point, building a number of cottages along the cliffs there. One of the more elaborate of the family’s homes was Edgewater, built between 1869 and 1870 on the Cliffs at the foot of Leroy Avenue. Designed by George Champlin Mason, the Italianate structure was enlivened with decorative surface details and supported a massive second empire roof. 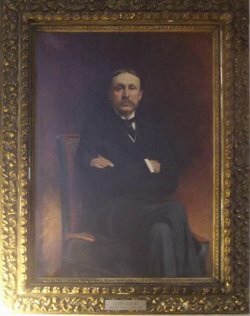 Less than twenty years later, Edgewater was purchased by Ogden Goelet, scion of the wealthy real estate clan (the family’s real estate holdings were second only to the Astors’ in New York). While it one of the most ornate cottages on the Cliff Walk, it didn’t match up to the social ambitions of Ogden’s wife May. One of the famed “marrying Wilson’s” of New York society, who would later see her daughter marry the Duke of Roxburghe, she wanted something far more palatial. 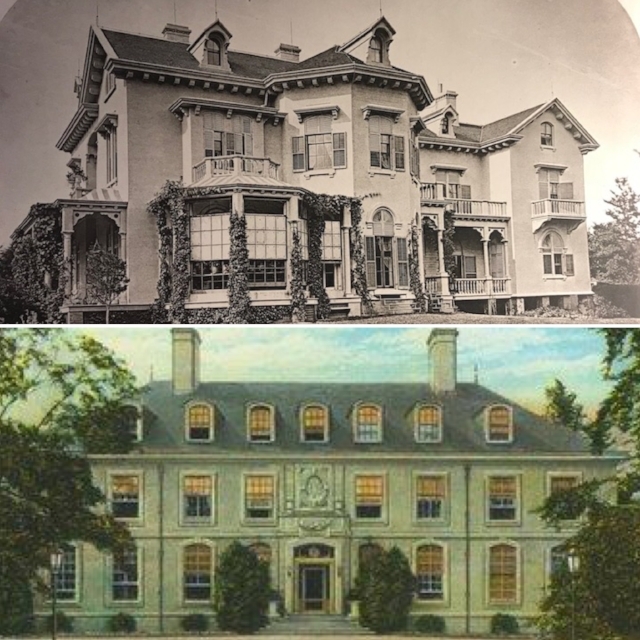 In short order Edgewater was razed, replaced by a 65-room mansion designed by Richard Morris Hunt, inspired by the Loire valley chateaux. Ironically, eventually May Goelet found her massive chateau too much to maintain, seldom using it after World War I. Her son Robert who inherited it after her death in 1929, attempted to give it his daughter (who supposedly told him the very thought of living there depressed her), and the Untied Nations to use as a possible headquarters. In 1947 he finally donated it to the Sisters of Mercy. They established a Catholic College there, which evolved into the well-respected Salve Regina today and has provided excellent stewardship of the Chateau. In 1900, E. Rollins Morse of Boston had mid-nineteenth century cottages sitting next to each other along Bellevue Avenue knocked down. They included the half-timbered Coles cottage and the Victorian Whiting cottage (originally built for Mrs. Colford Jones). Upon the three lots rose Villa Rosa, one of Ogden Codman’s most sublime creations. Sadly, after going through a series of owners, the cottage was hurriedly demolished at the end 1962 to avoid paying taxes on it the following year. Riviera was a rambling Italianate mansion set on landscaped grounds overlooking Newport’s Harbor. Added onto and embellished several times, it was eventually described as “well-nigh” perfect by George Champlin Mason. Under the ownership of the Hugh Dickey’s of Chicago, it became one of social centers of the summer colony. In 1903 the widowed Mrs. John Nicholas Brown purchased it. 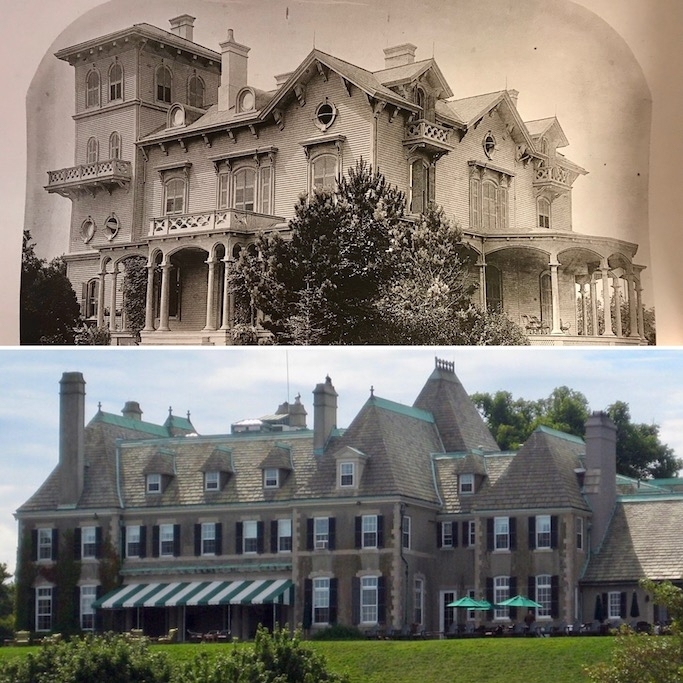 Deemed insufficiently grand to raise her infant son (dubbed by the press as “the richest boy in the world”) in, Mrs. Brown had the landmark house razed and had a much larger French provincial chateau built in its place named Harbor Court. Harbor Court continues to lord over Newport’s harbor to this day, presently owned by the New York Yacht Club. John H Glover chose one of Newport’s tallest (and windiest) spots atop Telegraph Hill for the site of his cottage. He commissioned Stanford White to design a handsome h-shaped villa, named Belvoir upon it. It was sold in 1900 to J Edward Addicks and was rented for several seasons by the William K Vanderbilt Jrs. In 1908 Addicks in turn sold Belvoir to Arthur Curtis James and his wife. The James originally planned to have the architectural firm of Howell and Stokes expand Belvoir, but when structural defects were found in the foundations, they decided to take it down and build anew. The result was Beacon Hill House, an interesting mansion faced in rough-cut stone, completed in 1910 A romantic farm complex in the form of Swiss village and extensive gardens eventually embellished the James estate as well. After the couples’ deaths (within weeks of each other in 1941) the house sat empty, fell prey to vandals and was eventually gutted by a fire in 1967. The remaining shell was bulldozed. Happily however, the Swiss farm complex and Mrs. James famed “Blue Garden” were restored decades later. In 1835 New Yorker Charles Russell had the foresight (or luck) to purchase a large tract of land around what is now, Narragansett Avenue, Bellevue and Webster Avenues. As the resort spread around him, he subdivided his property, selling off parcels at a tidy profit, while retaining 13 acres for himself. He named his estate Oaklawn, and had George Champlin Mason design a rambling Italianate cottage so beloved in the era on it. It was later owned by New York banker James Stillman, who expanded the cottage, adding a tower. He later sold it to William Fahnestock in 1922. Fahnestock lived there for several years before deciding to raze the place and replace it with something more modern. He had Charles Adam Platt design a loose interpretation of a French chateau with English elements for him. Named Bois Dore, it continues to be occupied as a private residence to this day.